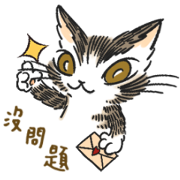 Dayan the Cat’s Chinese LINE sticker debut! In addition to daily greetings and hilarious phrases, this collection presents a variety of facial expressions: cozy, arrogant, and sometimes spoiled. Let’s find out more fun facts about this addicting cat!